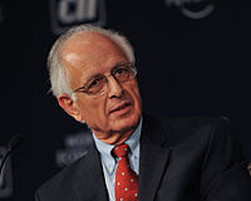 Arun Maira has held leadership positions in the private as well as the public sector, and therefore has a unique perspective on how they can work together to build a better India. He has led three rounds of participative and comprehensive scenario building for the future of India: in 1999 (with Confederation of Indian Industry), 2005 (with World Economic Forum), and 2011 (with Planning Commission for 5 years). Arun worked for 25 yrs with the Tata’s group at senior positions and was on the board of TELCO (now Tata Motors). Later he joined Arther D Little Inc, an international management consultancy, USA, and advised companies on growth strategies, and handling transformational change. He was also the Chairman of the Boston Consulting Group, a position he held for eight years. He has been Chairman of Axis Bank Foundation and Save the Children, India. He was also a board member at the India Brand Equity Foundation, the Indian Institute of Corporate Affairs, the UN Global Compact, and WWF India. Arun has been involved in several government committees and organisations, including the National Innovation Council. He has been on the board of several educational institutions and has chaired several national committees of the Confederation of Indian Industries. In 2009, Arun was appointed as a member of the Planning Commission. At this minister-level position, he led the development of strategies for the country on issues relating to industrialisation and urbanisation, and drove the formulation of policies and programmes in these areas. He also advised the Commission on its future role. He has written several books , namely Redesigning the Aeroplane While Flying: Reforming Institutions; Remaking India: One Country, One Destiny;Transforming Capitalism: Improving the World for Everyone, and Shaping the Future: Aspirational Leadership in India and Beyond.